The Halloween Ball, a night of costumes, dancing, dark arts—wait, what? It’s up to you to stop the troublemakers before the dance is ruined. Halloween Ball is a scenario in the HPS Freshman Year story arc. It may be played as a standalone, or it may be used with first-year characters who are already established in the Hope Preparatory School setting. A map of the dorm and a range of NPCs provide everything a gamemaster needs to run the scenario and experience a day in the life of a metahuman student. This scenario also provides background and game information on Sister Synestria’s Certified Soothsayers Society. This organization is devoted to providing the professional support necessary to distinguish between professionals highly talented in the fields of precognition and postcognition from mere charlatans. Their Certified Soothsayer Professional (CSP) certification program offers the gold standard recognized by governments and businesses worldwide. Direct Link to the M&M3E version. Direct Link to the ICONS version. This is the first product that we've featured Dan Houser as our new cover artist. In honor of that fact, here's a look at the great cover art he did for us without any interference from the publishing logos. The Substitute Now Available for ICONS! This came through a bit later than originally intended, but the ICONS conversion of HPS #1 The Substitute is now available through DriveThruRPG.com for just $4.99. The Hope Prep School Freshman Handbook provides additional details about the HPS setting used in this scenario. This PDF uses layers for ease of printing and is sized for compatibility with popular electronic reading devices. 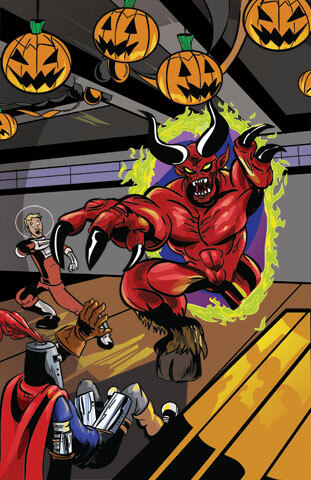 Halloween Ball, our next release is back from editing and in layout. I hope to have this one available for ICONS much sooner after the M&M3 release. Gen Con went very well for us this year, thanks to all who came out and played or just stopped by to ask questions. Our eight events, featuring the M&M3 versions of Orientation and the Substitute were well attended and well received. Both our players and GMs all seeemed to have a great time. Thanks to everyone for coming out and supporting us. Players went home with laminated student IDs featuring the characters that they played in the events. Over the course of the show, we handed out promotional postcards at both the DriveThruRPG and the Green Ronin booths. Many thanks to both companies for helping us to promote the setting. We also were privileged to meet quite a few bloggers and podcasters over the course of the show, several of whom I hope to be in touch with in the coming months. On Saturday, I was able to attend Pinnacle Entertainment Group's seminar. They were kind enough to give me an opportunity to announce that Hope Prep will be coming to Savage Worlds this fall. The license has been granted and work is well underway. The current goal is to have that available in September, barring any complications with other work. Finally, many thanks to all who took advantage of our "We Broke Even" bundles. The sale was a great success. I look forward to any feedback from those who chose to purchase the PDFs! Yesterday something very exciting happened in the course of Melior Via's history. We have now sold enough copies of the Hope Preparatory School Freshman Handbook to cover our development costs. I guess since I'm admitting my excitement about this, it makes it pretty clear that none of our other products have gotten to that level of success yet, but the fact that one of them has is a major milestone for us. So, we decided that we need to do something to celebrate the success. I realize that one sale just ended, but I think we can still launch another. 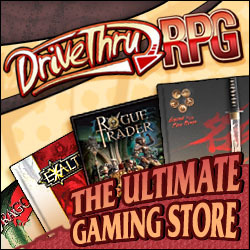 For the next week, there are two Hope Preparatory School bundles available through DriveThruRPG. They're each priced at $5.00 and include the Freshman Handbook along with the introductory scenario - Orientation. One is for M&M3 and the other is for ICONS. That's like buying Orientation and getting the Handbook for just a penny! This week is Gen Con - we look forward to a lot of great gaming at the show and hope to see folks who have enjoyed the Hope Prep setting. For those who can't attend, I hope you get a chance to get some games in at home. Jeff Preston just delivered a cover for our upcoming release - "The Substitute" and I wanted to go ahead and share it. We should have this available for purchase next week. Earlier this week, the ICONS edition of Orientation released. We're currently working on the Freshman Character Pack for ICONS as well. Some may have noticed that we're currently running a sale on the OneBookShelf sites. This continues through Sunday. All of our products are currently 20% off. That means the Freshman Handbook for ICONS and M&M3 are $3.99 each. It also includes the Freshman Character Pack and the introductory adventure - "Orientation" for M&M3. We're still in the process of getting Orientation and the Freshman Character Pack ready for ICONS release. 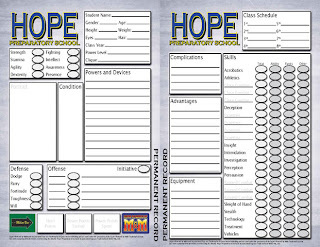 As I've worked on the characters, I needed to create a Hope Prep themed character sheet for ICONS. That sheet is now available for free download. Click on the thumbnail to grab the PDF from acrobat.com. Artwork for our next Hope Prep Scenario - the Substitute - has started to trickle in, and it's looking terrific. I hope to have that adventure heading into layout early next week. We're on track for a mid-June release for M&M3. The ICONS release will likely slip into July. I thought today I would give a quick update on various projects so that readers might learn what Melior Via is currently pursuing. We have a number of irons in the fire, so this may seem just a wee bit unfocused. Fortunately, we have a number of people working on these projects, so the workload is nicely diversified. The next Hope Preparatory School scenario (The Substitute) is making solid progress. Scott Schletz's draft is currently in editing. Jeff Preston is once more handling the cover. Wesley Street is working on the maps. Interior art descriptions need to be revised and assigned. We are on schedule for a June release for the M&M 3rd Edition release. For those following the convention scene, the description has already been posted among our Gen Con and Origins events. The ICONS conversion for Orientation and the Freshman Character Pack are also both making solid progress. We should have those ready for a June release as well. -We have another system conversion for the HPS Freshman Handbook in progress. -We recently contracted Dan Houser to create several pieces. These will go into a new HPS Character Pack. -We have an additional setting in development. This one is not a supers setting, and it uses another licensed system. -Preliminary writing on the third HPS scenario has been contracted. It's due for an August release in the M&M system. 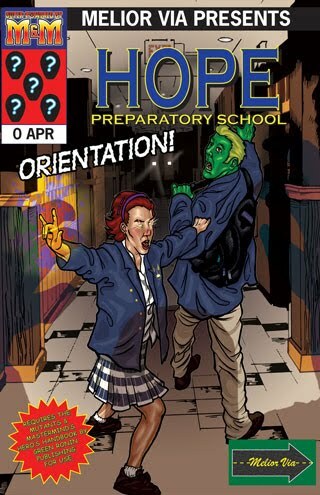 We're happy to announce that Melior Via has just released the Hope Preparatory Freshman Handbook for ICONS Superpowered Roleplaying from Adamant Entertainment. This is the same core material featured in the Super-Powered by M&M version, but the Game Mechanics section covering character creation and the freshman faculty members has been modified for the new system. Moving forward, Melior Via will offer Hope Preparatory School materials that support both game systems. Our current plan is to release the Freshman Character Pack and Orientation! for ICONS next month. Well, that went fast. We're thrilled to report that all of our Hope Preparatory School events for Gen Con Indy 2011 were sold out within about an hour of event registration going live. #1) Keep an eye on the event listings. It's not uncommon for a ticket or two to reenter circulation over the next few days and weeks. #2) Show up to the events with generics. Many of our events are scheduled for 8AM. It's not at all uncommon for folks to choose to oversleep. All of our scenarios are intended for six players, and we'd vastly prefer to accommodate that number. #3) It's unlikely, but we might manage to scare up another GM between now and the convention. If we can obtain another Gamemaster, we'll keep that person on standby to run tables for players who arrive with generic tickets. Thanks for the support! We look forward to meeting with as many players as possible at the show. I haven't seen this mentioned anywhere else, but Origins has posted their 2011 game schedules. Melior Via is supporting the Hope Preparatory School setting with a number of events. Unfortunately, the Origins spreadsheets do not yet show a location. (I also couldn't track down when event registration was set to open.) Regardless, I'm happy to see that there are now event lists available to download. As with Gen Con Indy, we'll be running four sessions each of two different scenarios. (Yes, they're the same scenarios for both conventions.) Both use the M&M 3rd Edition rules set. We're working on a (small) something special for all of the players who are able to attend our events. For anyone else who is interested in running a Hope Prep game at their local convention or game day, please drop a line to info@meliorvia.com We'll do our best to help you out. Also, as a reminder -- Gen Con event registration opens up at Noon EDT, this Sunday 5/1/11. Get those trigger fingers ready to register. Gen Con Indy has just posted their 2011 Event Catalog. Melior Via is supporting the Hope Preparatory School setting with a number of events. Currently, all of our events are scheduled to take place in the Pennsylvania Station Room A of the Crowne Plaza. If past history is any indication, though, these might end up with their locations shuffled, so be sure to check the catalog at the convention to verify your locations. We'll be running four sessions each of two different scenarios. Both use the M&M 3rd Edition rules set. Melior Via has two new releases for our Hope Preparatory School setting. Both are now available on DriveThruRPG, and both use the M&M 3E rules system. Orientation! Is an introductory adventure for Hope Prep. Players get to learn about the school at the same time as their characters, who are among the incoming freshmen. The scenario includes background information on the sinister Alchemical Cabal, full color maps of the school, and player handouts in 49 digest-sized pages. Regularly priced at $4.99, we’re offering a special introductory price of $2.49 through the end of April to those who use this discount link. The Freshman Character Pack provides a fully illustrated set of six PL7 characters for use with the Hope Prep adventures. For those who do not have an opportunity to create characters, these provide a variety of options with detailed backgrounds and personalities. 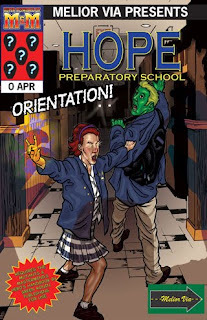 The freshmen students could also be used add additional NPC students to a Hope Prep campaign, or even as a group of metahuman students on field trip for a more conventional supers campaign. A page of stand ups for the six characters are also included. This 20 letter-sized page PDF is priced at $2.99. Please note that all of our releases use PDF layers. By selecting which layers to print, the printer-friendly version is built right into the main document. 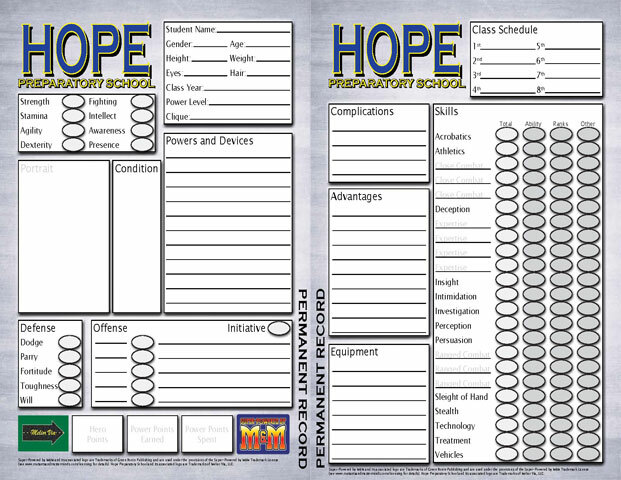 In between working on other materials, I went ahead and assembled a Hope Preparatory School themed character sheet for M&M3E. I've hosted it at Acrobat.com, where it's freely available. (No login is required.) Please let me know if you have any difficulties using or obtaining the sheet. Like the HPS Freshman Handbook, this PDF uses layers. I've placed the blue-grey page background on its own layer so that anyone who wishes to save ink can turn that off prior to printing. Here's a quick preview of the sheet, so that folks can see it. Behold the standardized testing bubbles! Progress is slow, but steady. Last night, the draft of Hope Preparatory School: Freshman Orientation Guide was delivered to the editor for review. At the same time, the last two artists contracts were signed for interior art. Things are progressing nicely to have the game setting PDF ready to hit sale in March.